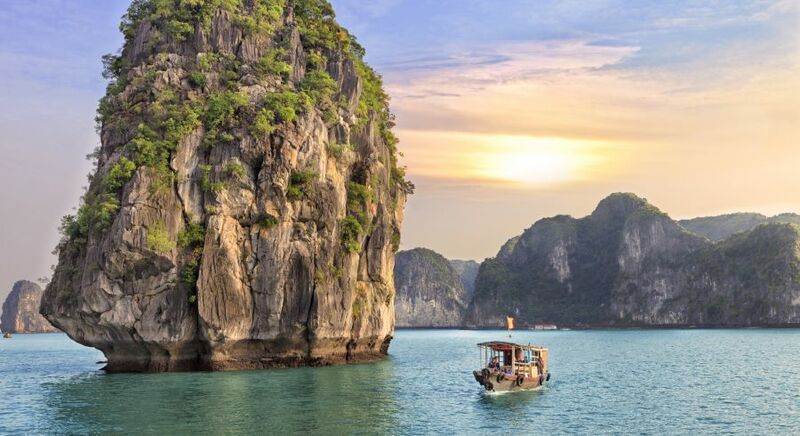 Halong Bay or Mekong Delta: Which cruise is perfect for you? 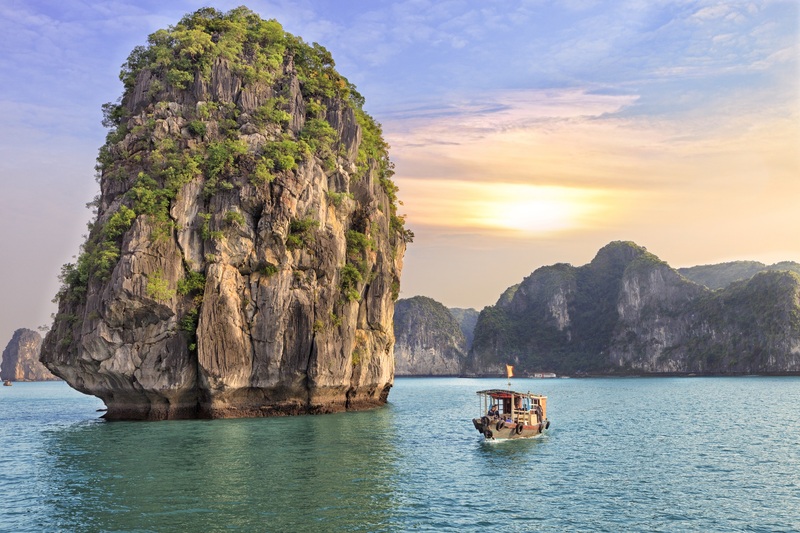 Halong Bay or Mekong Delta: Which cruise is perfect for you? From the towering limestone karsts of Halong Bay to the tranquil waterways of the Mekong Delta, here’s your lowdown on the contrasting water worlds of Vietnam. 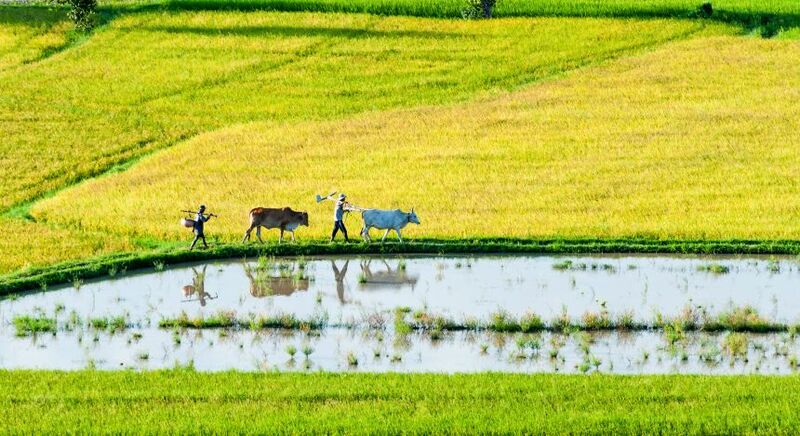 Lush green paddy fields, lumbering buffaloes and conical-hatted farmers make up the classic image of Vietnam. Once a lesser-known tourist destination, Vietnam has become widely popular in recent years. The northern capital of Hanoi consistently ranks among the world’s top 10 destinations on TripAdvisor. Ho Chi Minh City (HCMC), to the south, has transformed from a war-torn city to a thriving metropolis. Despite urban allures, centuries-old architecture, war history, and a rich culture with Southeast Asian, Chinese and French influences, it’s Vietnam’s striking landscapes that most impress. 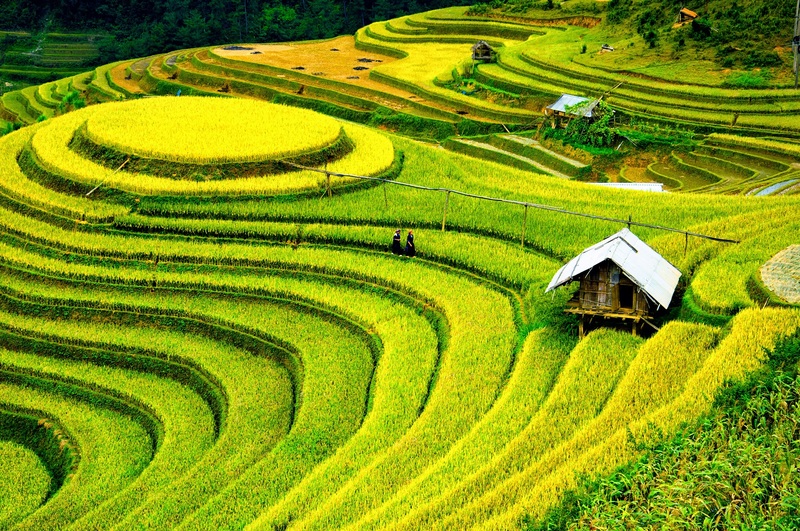 Vietnam is known for its stunning landscapes, such as the rice terraces of Mu Cang Chai and Lao Cai. 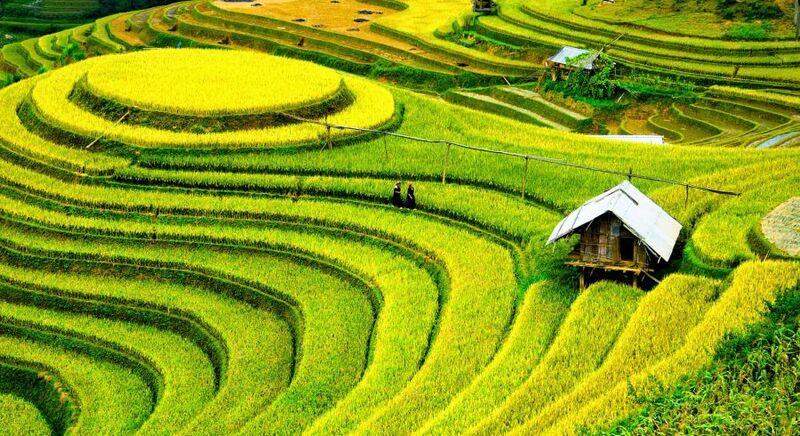 Despite urban allures and centuries-old history and culture, it’s Vietnam’s striking landscapes that most impress. To the south of its narrow waist, Vietnam fantails into the splendid Mekong delta. In stark contrast to the flat rice land of the delta where boats, houses and markets float upon innumerable rivulets, canals and streams that criss-cross the scenery like arteries, is the legendary Halong Bay. Set in the northeast, the scatter of jagged emerald islands and wind-and wave-eroded karst caves topped by forests jut out of the sea at Halong – a magical spectacle in the early morning mist. 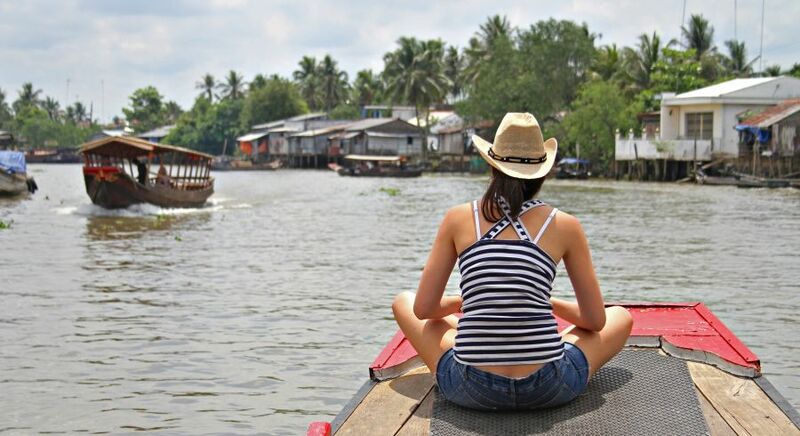 So how do you choose between Halong Bay or Mekong delta? Here’s the lowdown on the exclusive culture, cuisine and activities along the two water worlds. ‘Ha Long’, or the ‘Bay of Descending Dragons’, in northeastern Vietnam. ‘Ha Long’ or the ‘Bay of Descending Dragons’, four hours from the capital of Hanoi, is a spectacular seascape sculpted by nature in the Gulf of Tonkin. With over 1600 islands – most of which are uninhabited, there are several large caves located within the islands for you to discover. The biggest of these is a wooden cave, formerly known as the Grotte des Merveilles. Cannon Fort, on the Bay’s largest island – Cat Ba, offers one of the best views in Vietnam. From here you can survey astounding panoramas of Cat Ba’s jungle-clad hills rolling down to the karst-punctuated sea beyond. Explore pristine beaches and lush, tropical islands at Halong Bay. The best way to enjoy the many wonders that pepper this north-eastern Bay is by boat or cruise ship. 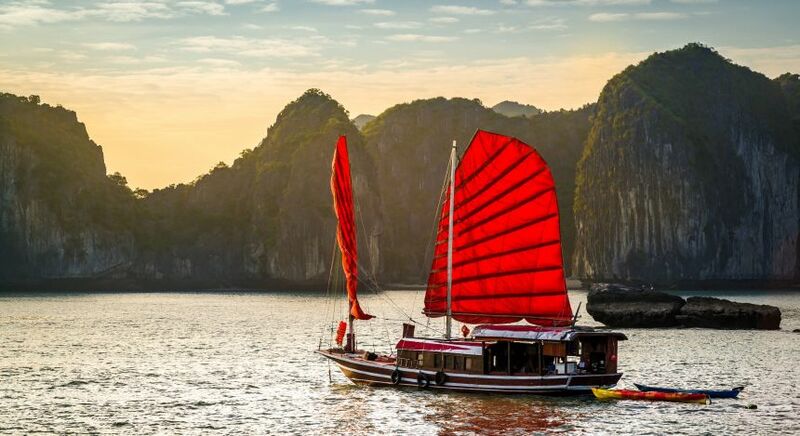 Opt for the Indochina Junk Halong Bay tours and enjoy a luxury Halong Bay cruise aboard the Dragon’s Pearl – a traditional Vietnamese boat modeled on ancient wooden Chinese junks. For some romantic elegance, plump for the one-cabin L’Amour (Princess) Junk. 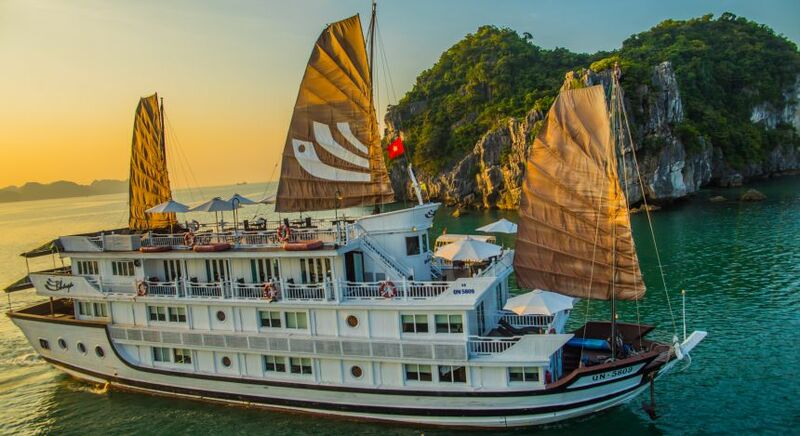 With numerous venues at which to relax and rejuvenate as you drink in the stunning UNESCO World Heritage vistas of Halong Bay, the Stellar and Bhaya Cruises are also great options. Or venture to the idyllic La Han Bay on the Ginger Cruise for an intimate sailing experience amid breathtaking panoramas. The best way to enjoy the many wonders that pepper Halong Bay is by boat or cruise ship. 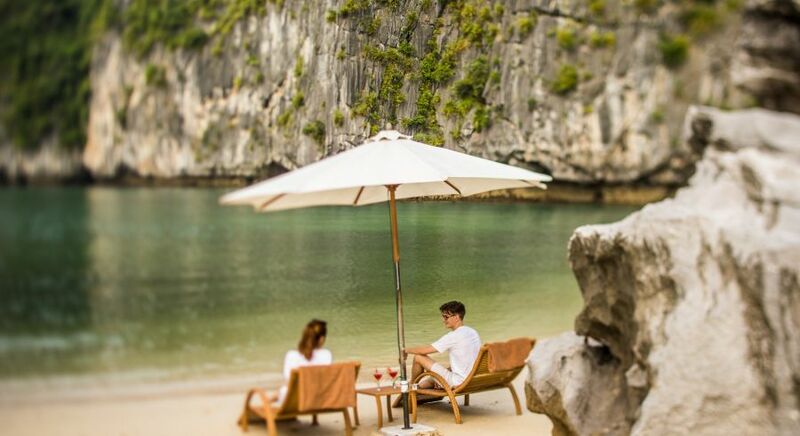 Experience the beauty of this most acclaimed tourist spots in Southeast Asia as a guide shows you hidden lagoons, forested islets, stunning limestone cliffs and secluded bays, like the Bait Tu Long where you can swim and kayak. The sugar-white coastlines of Ba Trai Dao (Three Peaches Beach) and Soi Sim offer some unique barbecue experiences. Listen to the sweet melody of birds, winds and waves, as the crew delivers an array of succulent and grilled seafood under a blue sky! 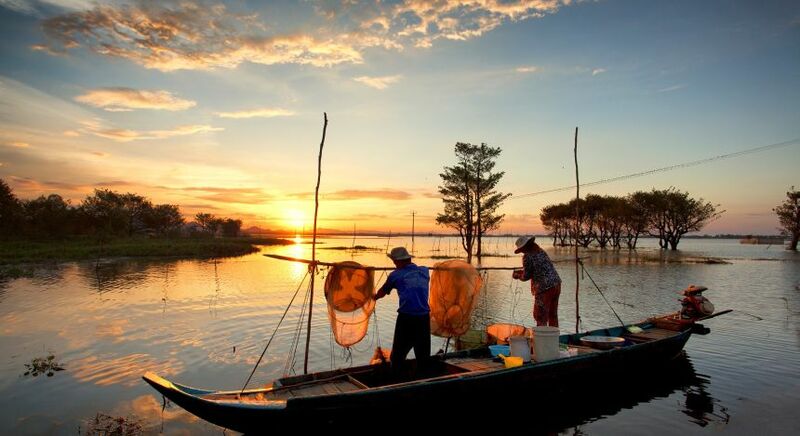 If you fancy a fishing excursion, visit the scenic fishing villages at Cua Van, Ba Hang, Vung Vieng and Cong Dam. The locals are very sociable and willing to guide you on how to row a sampan, spread the net, bait a hook…. Enjoy a cooking demonstration on your cruise ship. Sundowners on the bay can be stunning affairs! Enjoy panoramic views of the Bay from the shore. 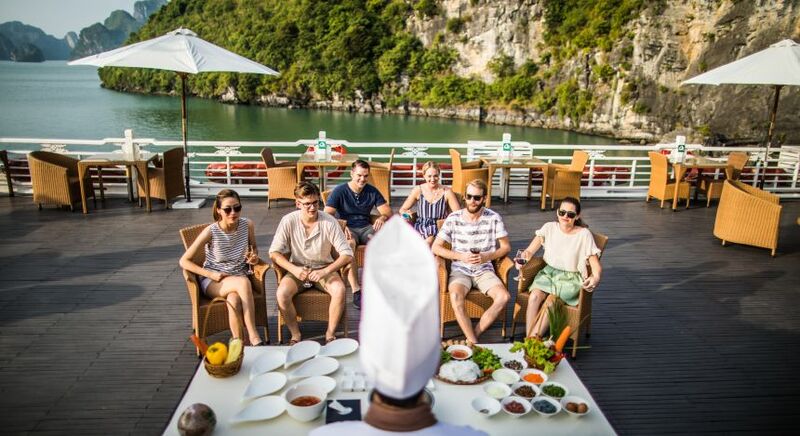 Begin a new day with Tai Chi sessions onboard, amid the early morning spectacle of Halong Bay. Getting yourself pampered at the spa when you are out at sea could also be an excellent treat. Make sure to book in advance. 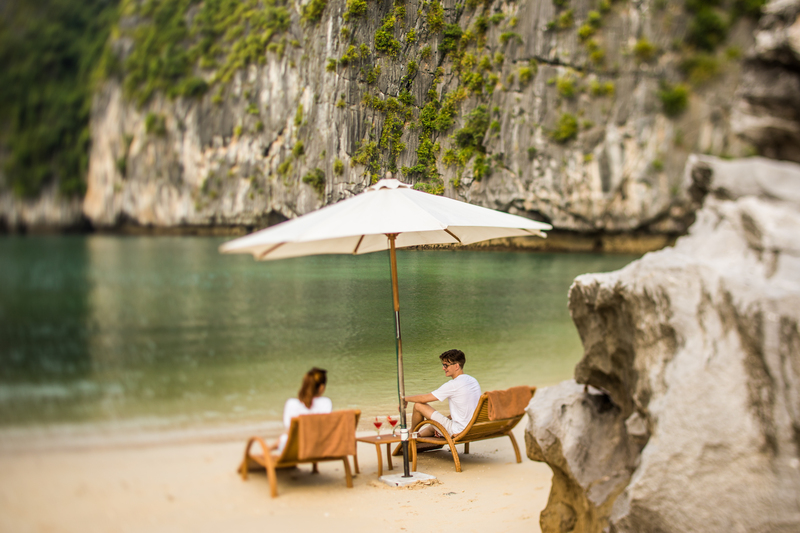 If you choose to stay on shore, check in Hotel Novotel Halong Bay set on the coastline of Bai Chay beach, which provides great photo ops with panoramic views of the Bay. To catch a glimpse of the fifteen million people who live in the wetlands, you need to join them on the river. 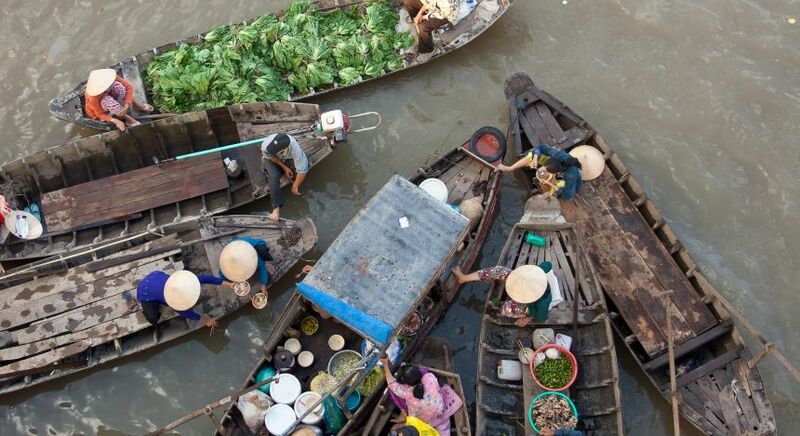 The Mekong Delta is a bustling hub of activity. 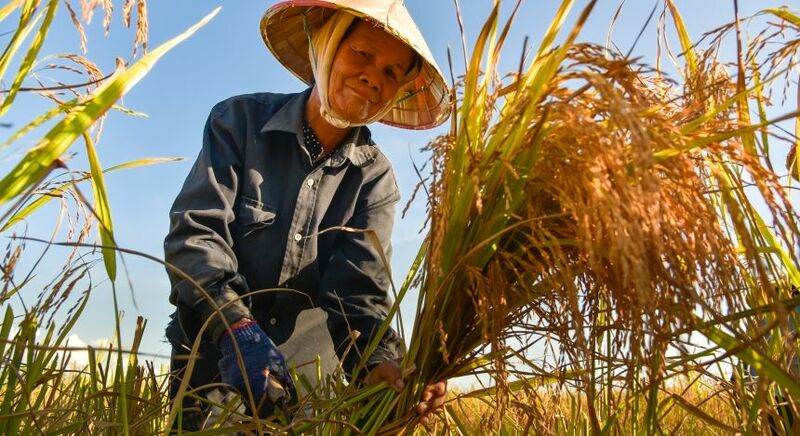 The comma-shaped flatland stretching from south of Ho Chi Minh City, to the Gulf of Thailand is intertwined by land and water that provide the perfect conditions for growing rice – bestowing the Mekong Delta with the rightful title – ‘rice bowl’ of Vietnam. With its alluvial-rich soil, the Delta also nourishes the fruit basket of the country as lush orchards overflow with mangoes, papayas and dragon fruit, and plantations brim with bananas, coconuts and pineapples. With over 1,000 recorded animal species and new species of plants, fish, lizards, and mammals discovered in previously unexplored areas, including the Laotian rock rat that was thought to be extinct, the Delta has been dubbed as a ‘biological treasure trove’. 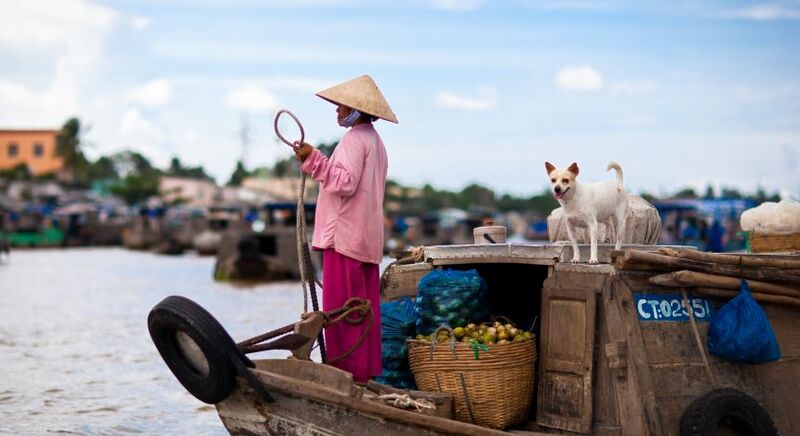 At the floating market in the Mekong Delta, you can buy everyday articles or exotic goods. 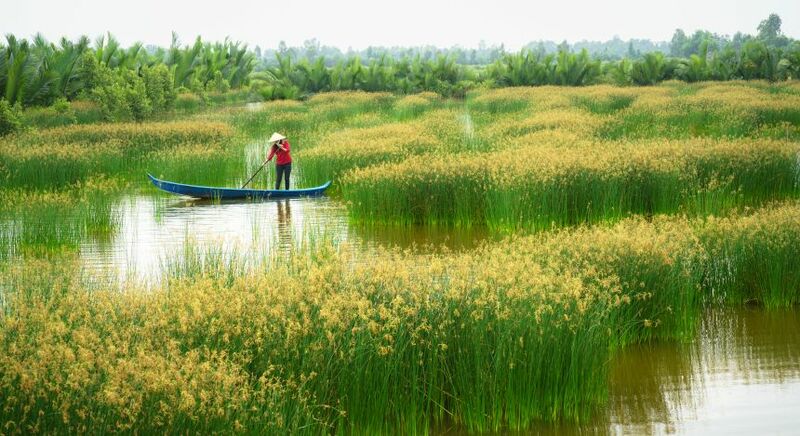 The Delta is famous for its lush green rice paddies, which you can explore on your tour. 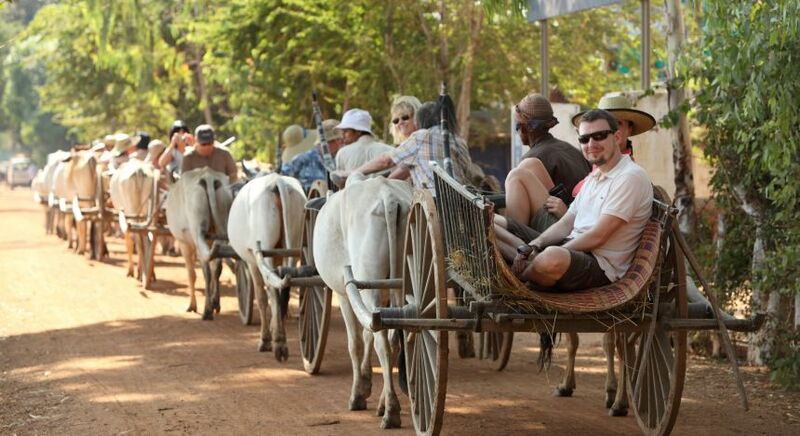 How about a ride in a traditional bullock cart, the local way? With everything revolving around the waterways, the Delta is a world afloat. To catch a glimpse of the fifteen million people who live in the wetlands, you need to join them on the river. 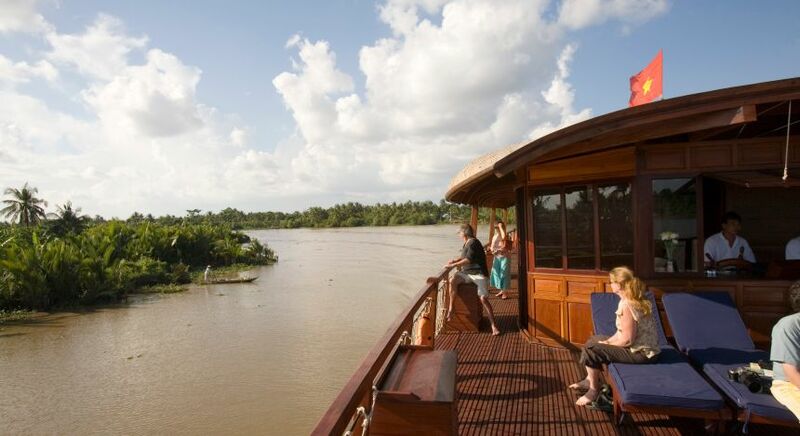 Hop onto the Bassac Cruise from My Tho, but before you do, a visit to the ancient southern architectural gem reflecting a mixture of Chinese, Vietnamese and Angkor (Cambodian) building styles with elaborately carved oblong and horizontal net like panels – the Vinh Trang Pagoda (in My Tho itself), would be worth your while. Bricks and mortar aside, the temple will be memorable if you can arrive when the monks are chanting, in the morning. 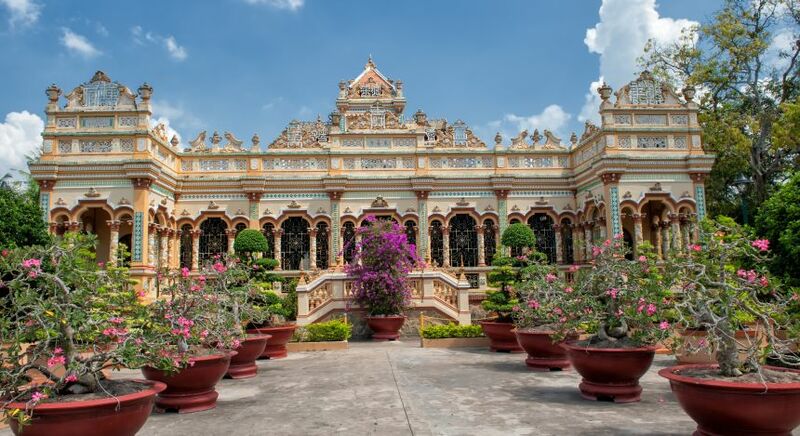 See the elaborately carved Vinh Trang Pagoda in My Tho. Hop into a traditional boat and explore the many channels around the Delta. 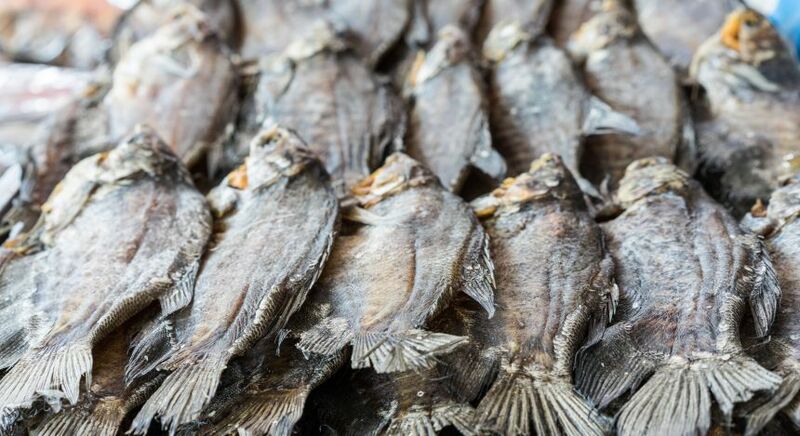 Dried fish is a popular snack for the local people at the Delta. How about a rest stop during you cruise? To enjoy countryside scenery and river life, board a smaller wooden sampan (boat), hopping off to explore scenic villages every now and then. 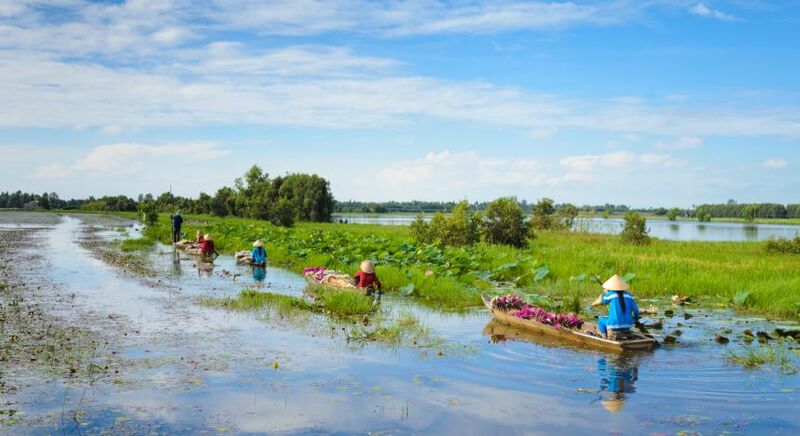 Continue exploring the Mekong landscape with stopover at the Thot Not Bird Sanctuary, a magnificent 1.3-hectare area overgrown by huge bamboo and home to thousands of resident storks, snowy egrets and other avians. At the quintessentially Vietnamese ‘craft village’, small communities work together to manufacture products such as knives, rush mats, bamboo bird cages, ceramics, rice wine, and dozens of other commonplace and unusual articles. Visit a bamboo-knitting hamlet in Thot Not or a carpentry craft town in Chomo. Or visit the local coconut-candy factories in Ben Tre, the ‘Land of Coconut’. Sold throughout the country, and also exported to other Asian countries, Australia, Europe and North America, the keo dua or coconut candy of Vietnam is world famous. 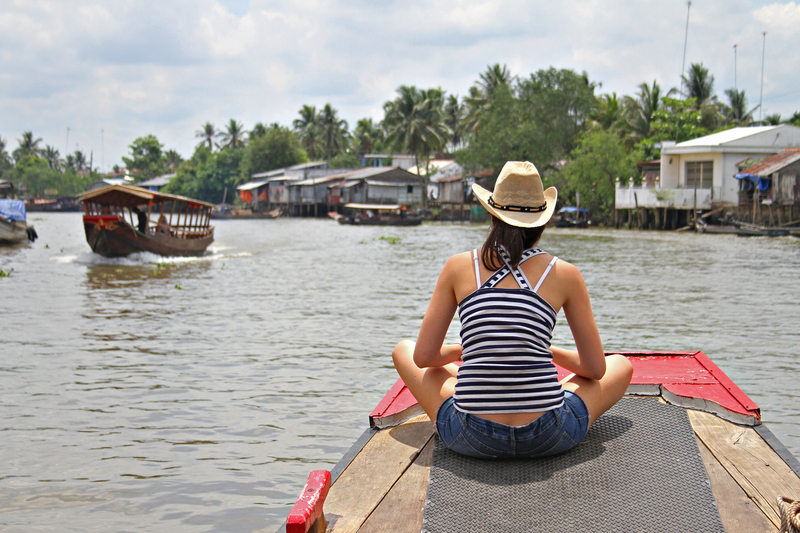 To enjoy countryside scenery and river life, board a smaller wooden sampan (boat). Encounter monkeys and scampering macaques that dangle from ancient temples and parked vans around the villages. Then stretch your legs and hop on a bicycle for a short ride along narrow village lanes, past fruit orchards, never ending water canals, hundreds of rickety bridges and small ferry crossings and all those locals waving at you and greeting with “xin chao” as you pedal by. Taste fresh fruits, like the juicy yellow-fleshed sapodillas when you arrive at the home of a tropical fruit farmer and amble around his orchard – this is traditional hospitality at its truest! 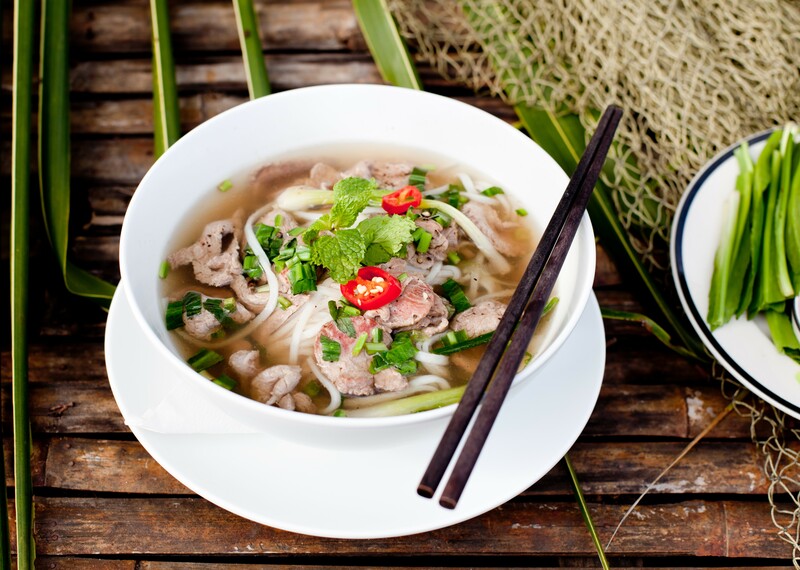 While cruising down the meandering Mekong, stop at smaller sampan boats that serve as cafes and you may just be rewarded with the best noodle soup you’ve ever tasted! 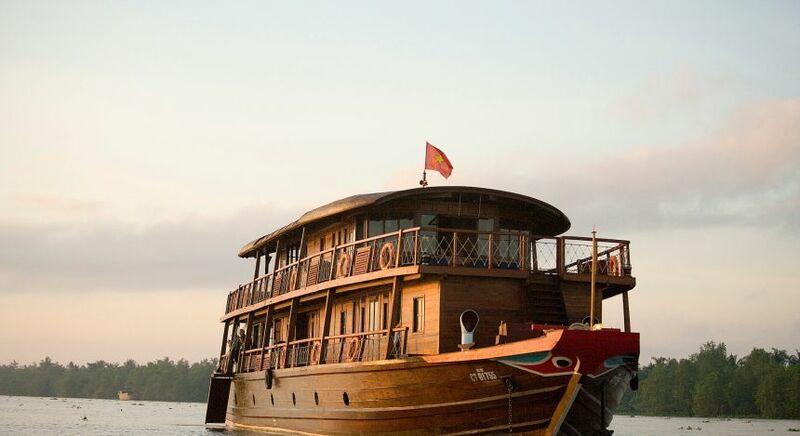 Board the Mekong Queen, a wooden, motorboat and sail to the enormous Cai Rang floating market early in the morning. Witness the lively panorama around as hundreds of sampans bump and jostle to trade everything from sugar cane to pigs, and mountains of fruit. It is quite possible to stop at smaller sampans serving as cafes, and enjoy an iced cup of coffee, soft drinks, or a Vietnamese noodle soup for breakfast. Stay at the Victoria Hotel Can Tho. Set within magnificent gardens and colonial style architecture, it is situated on the banks of the Hau River – known for its charming sunsets and peaceful scenery. Alternatively, located on the banks of the Bassac River crossing, the handsome Indochina-inspired Victoria Hotel Chau Doc offers the ever-changing scenery of the fascinating Chau Doc region. 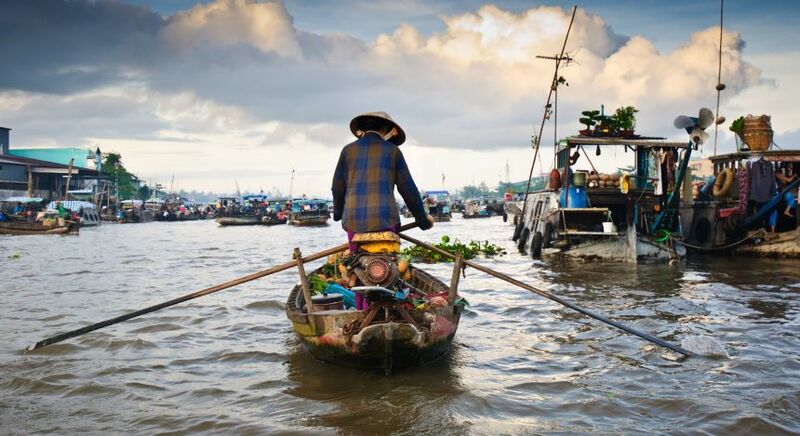 Whether you choose Halong Bay or Mekong Delta, do make a trip to Saigon. Ho Chi Minh City, as Saigon is now called, is rated by Forbes magazine as one of the top 10 street food havens in the world! Vietnamese cuisine is known for its freshness. Not a place for curry lovers, the noodle dishes and stir-fries here are light, citrusy, and loaded with herbs. 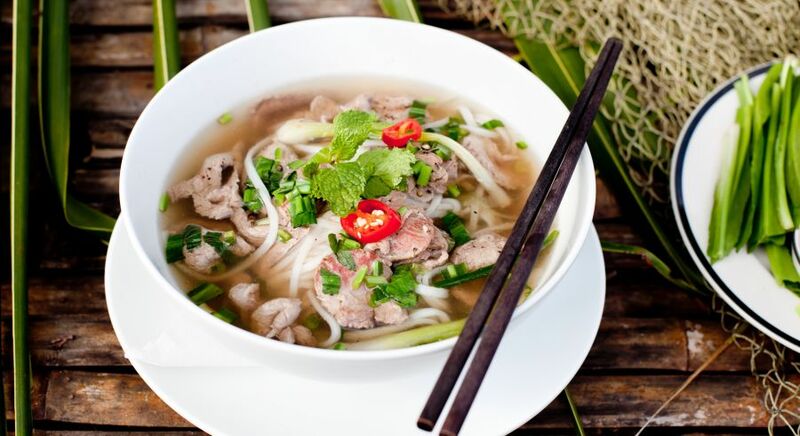 While North Vietnam food has more Chinese influence –fresh, light broths, with mainly noodles, South Vietnam food is sweet and spicy with more colorful and heavy broths accompanied with rice. 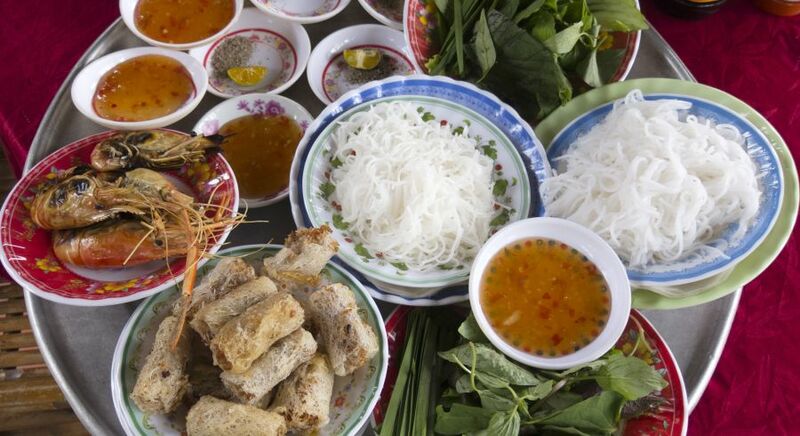 Known for its abundant seafood, the Halong Bay Market offers some truly unique food experiences that would satisfy even the pickiest tourists. Enjoy the famous dipped squid; feast on the Halong grilled oysters served with cold beer; or slurp the sweet, sour, spicy, salty (all in one salver) limuloid. As the largest city in the Mekong Delta that still retains a small town feel, Can Tho is an excellent place to experience the food of Vietnam’s deep south, including many local specialties like the Sa Dec and My Tho noodles – hugely popular thanks to their sweet taste, chewy and distinctive flavor; or the noodle made from sliced flour cooked to perfection with duck meat and with a pinch of ginger fish sauce in Ben Tre. 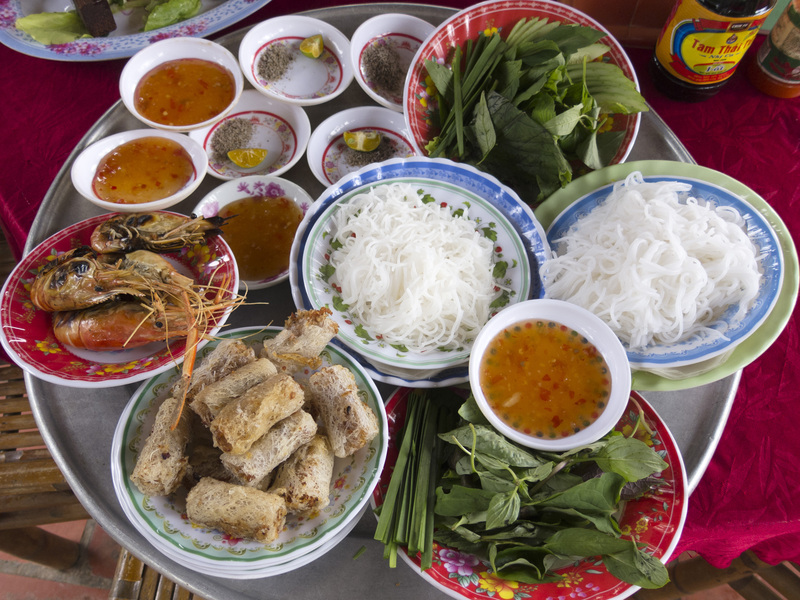 Read more about the food of Vietnam. Although you can travel to Halong Bay all year round, the best time to visit the region is during spring (March-April), and fall (September-October) when the weather is cool. 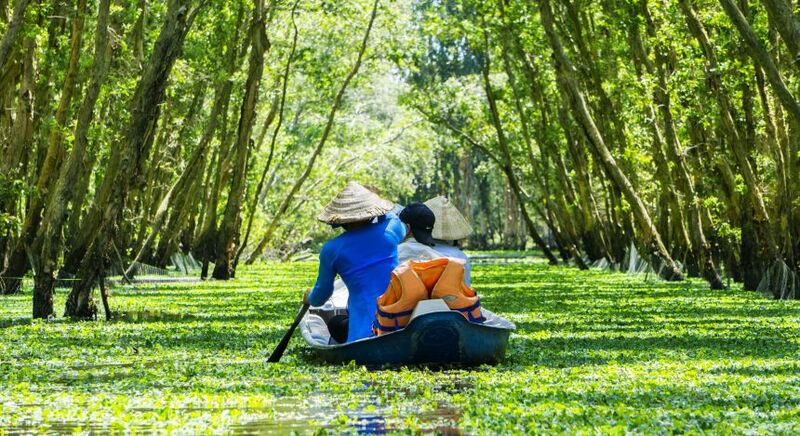 The Mekong Delta reveals its best during the dry months – December to May when the sky is crystal clear, the land is lush and the water is calm. But if you are a fruit lover, June to September, although hot and humid, could be just as good with the greatest variety of tropical fruits available. Halong Bay or Mekong Delta: The choice is yours! While the picture-perfect bay, towering limestone karsts and secluded islands of Halong attract a lot of tourists, Mekong offers personal, exploratory and cultural experiences with historic relics and temples, rice paddies, and vibrant floating markets and villages on the river. 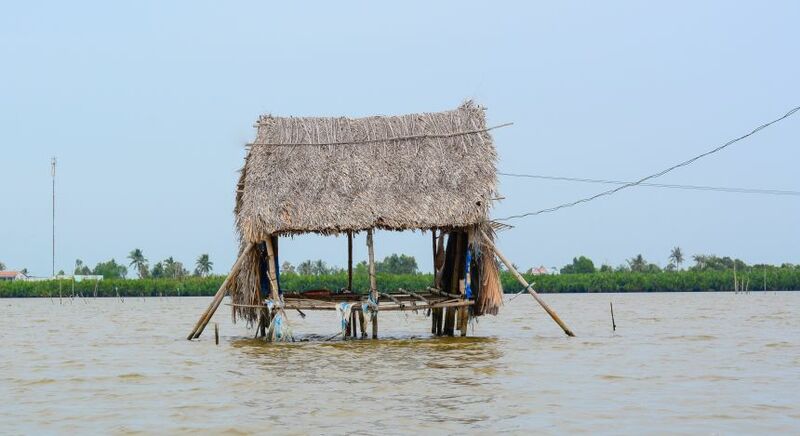 So back to the question – Halong Bay or Mekong Delta? It really depends on your taste. 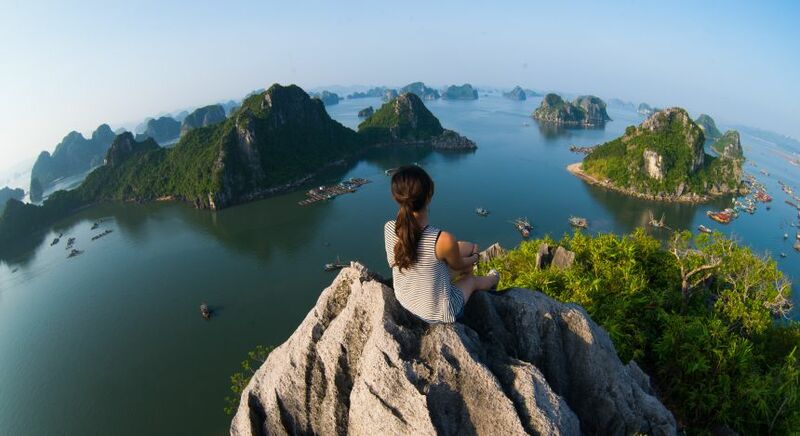 Halong Bay with its ethereal beauty of karst scenery, emerald isles and spectacular seascapes at every turn, is one of the foremost attractions in Vietnam. 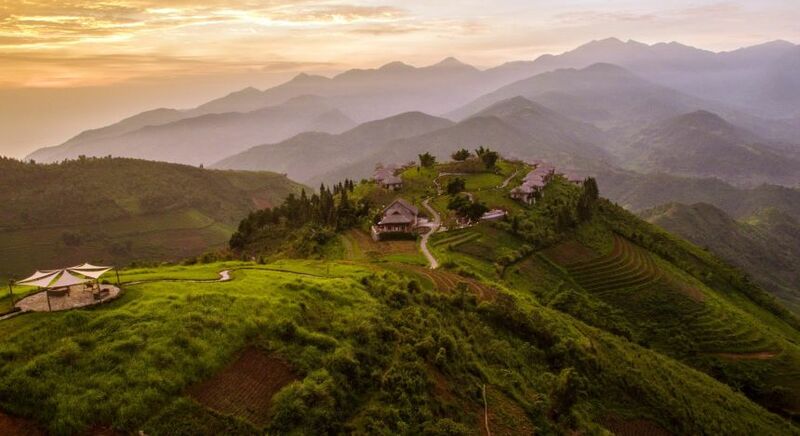 Additionally, Hanoi, the point of arrival and departure for Halong, offers interesting and unique cultural experiences in Vietnam as does the the hilly region of Sapa nearby. So, Halong Bay or Mekong Delta – which should you choose? While picture-perfect Halong attracts a lot of tourists, Mekong offers personal, exploratory and cultural experiences with remains of Viet Cong bunkers, ornate Khmer pagodas and Buddhist temple, stilt houses, lush rice fields, vibrant floating markets and villages on the river. 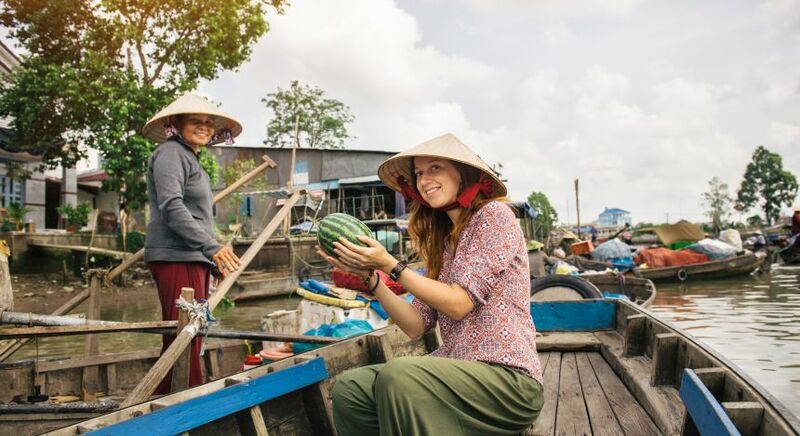 Visit the Mekong Delta for a classic Southeast Asian experience, and if you wish to see Cambodia, you could get there via boat from the Delta. 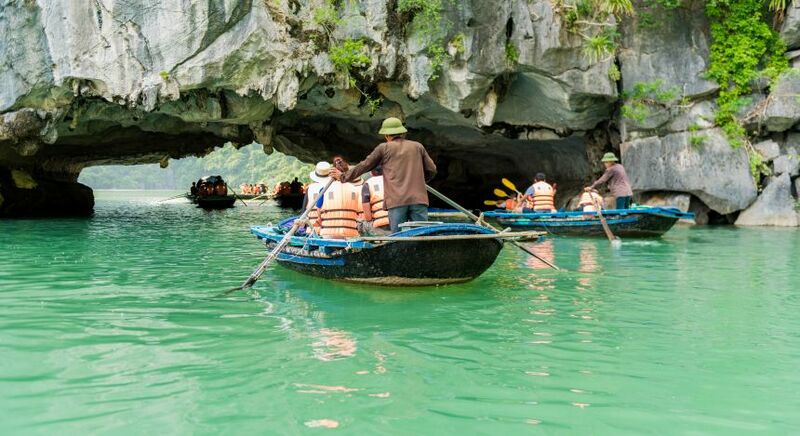 Or cruise the emerald waters of the ethereal Halong. Whether it is Halong Bay or Mekong Delta, they will remain etched in your memory for a lifetime. Lush deltaic landscape in southern Vietnam. 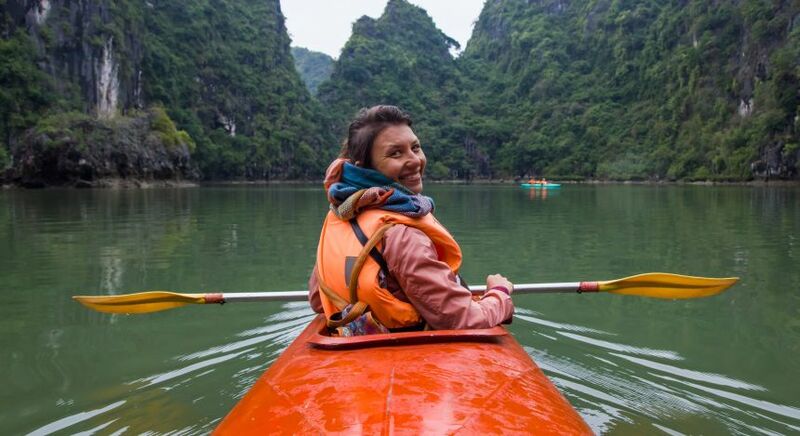 Whether it’s the Halong Bay or Mekong Delta, our destination experts are happy to help you customize your private tour to suit your specific interests. Get in touch with us today for your tailor-made itinerary!